"This is a great and easy recipe that includes cod, creamy coconut milk, and hot sauce. The results are amazing and crowd-pleasing. Serve with rice." Rub enough olive oil onto cod fillets to coat; season with salt and pepper. Heat about 1 tablespoon olive oil in a skillet over medium-high heat; saute onion, red bell pepper, and garlic until tender, about 2 minutes. Stir diced tomatoes into onion mixture. 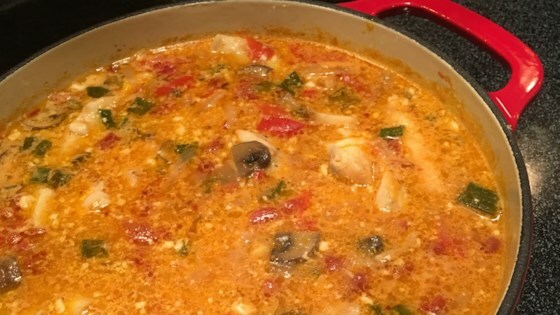 Arrange cod fillets on top of tomato mixture and pour coconut milk over fillets. Sprinkle green onion over cod fillets and top with Sriracha hot sauce. Cover skillet, turn heat to low, and cook until fish flakes easily with a fork and stew is thickened, about 1 hour. I used to make this a lot when I was in Brazil, and you don't need to use only cod. You can choose another fish. Loved this stew. I used tomatoes with chili peppers and it had a nice warmth. The next day I threw some shrimp in the leftover stew and it was a delicious lunch. Totally adding this to my regular repertoire. It's so easy and delicious! You'll impress your friends if you make it for a group. I substituted cod for ling fish which held up really well. A very flavorful, quick and easy to prepare. My whole family loved this.